SACRAMENTO, Calif. (AP) — The only place the Sacramento Kings are moving to is a new downtown home in California's capital. A year after almost being wiped off the NBA map, Sacramento cleared the most critical political hurdle late Tuesday night when the City Council approved a plan to help finance an estimated $391 million arena, setting off cheers through the cramped chambers that spilled onto the streets of downtown with a message that echoed from Anaheim to Seattle and across the basketball world. "Long live Sacramento, and long live the Kings!" shouted Sacramento Mayor and former NBA All-Star Kevin Johnson to a sea of supporters that packed the grounds for the historic vote. The non-binding term sheet, signed off by the Kings and the NBA last week, will keep the team in Sacramento for at least another 30 years. Cheers rang out from supporters who cramped the council's chambers when the plan passed by a 7-2 vote — the last coming with Johnson screaming "Yeeeees!" — and pushed the city's portion of the agreement forward. Binding contracts from all sides, which are expected to be a formality, could be signed as soon as April. Asked what the biggest challenge remaining was, Johnson told the crowd: "That everybody behind me is not hung over going into tomorrow." Under the agreement, the city will contribute $255.5 million to the project, mostly by leasing out parking garages around the facility. The city is also exploring an option to establish a parking authority instead. The Kings have agreed to pay $73.25 million and arena operator AEG will contribute $58.75 million. The remaining gap will be covered by a ticket surcharge, advertising around the facility, the sale of public lands and a sponsorship campaign to sell bricks and plaques around the complex. Construction is expected to begin in the late spring or early summer next year on the arena, which would open for the 2015-16 season in the downtown rail yards. 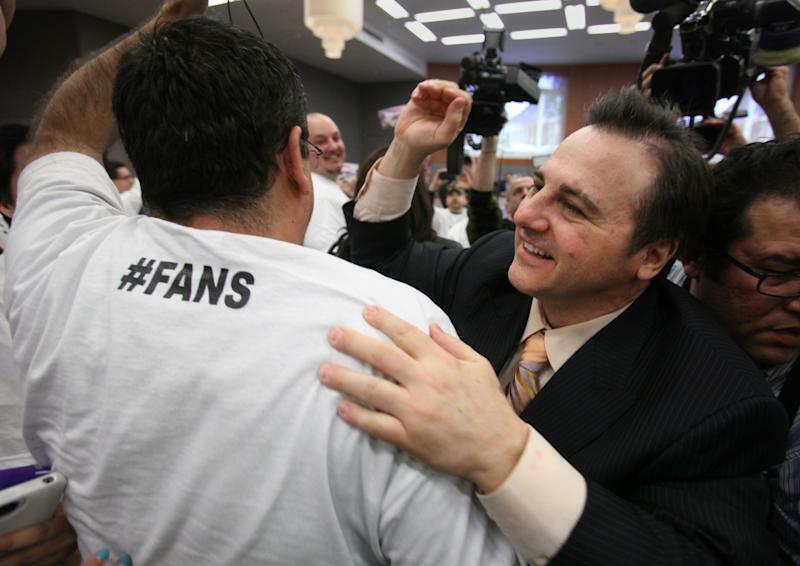 "I want to thank you on behalf of my family and our organization for taking the next step forward," Kings co-owner Gavin Maloof told the council. "We look forward in working with you throughout this process and we are excited about this. We appreciate your efforts. 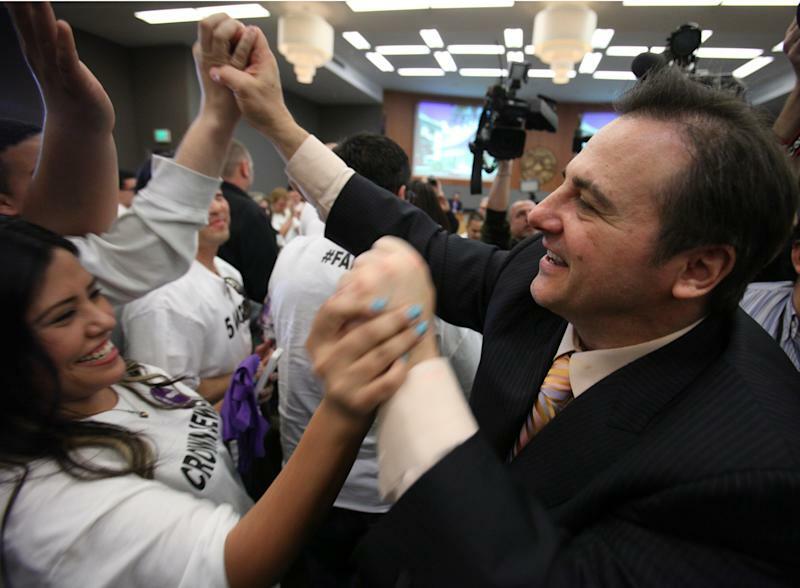 This is a great day for Sacramento." The meeting packed the council chambers to its capacity of about 500 and residents on both sides clogged downtown with signs, shirts and even songs. City Manager John Shirey told the council that the decision would be "one of the toughest votes of your career" and implored members to approve the plan for the economic benefit, job creation and immeasurable notoriety of remaining a major professional sports city, saying "there are only 30 of those (NBA) franchises in all the world and we happen to have one of them." "The status quo is not really an option before you this evening," Shirey said. "If we do nothing, the Kings will likely leave Sacramento." Maloof walked into the chamber just before the meeting to a light standing ovation. He was later joined by rookie point guard Isaiah Thomas, who also drew light cheers. "I'm glad I came down here. This is a historical time for the city," said Thomas, who was invited by the mayor to attend. A line of residents snaked around City Hall and seemingly every TV truck and radio station in the Central Valley was broadcasting outside. One fan wore Johnson's old Phoenix Suns jersey among the scores of Kings signs and jerseys in the crowd. A group of about 120 supporters of the plan wore white T-shirts with black letters that read "5 Votes." "This is bigger than basketball," said Michael Tavares, one of the leaders of the group called (hash)Fans, which stands for Fund Arena Now Sacramento. "It's about making Sacramento a destination." Opponents and proponents of the plan were allowed to speak for 2 minutes. Each side was granted 45 minutes, and those who couldn't reach the lectern in the allotted time were allowed to stand in acknowledgement of their support afterward. The more than 4-hour meeting brought out some animated speakers, including a man who wore a hard hat and sang a song to start construction soon, a young woman who started to cry while arguing other public works such as schools and parks were being ignored, and others just raised their voices and pounded their fists. Most, however, remained civilized. Those against the plan argued it steers public money toward a private company, that sports arenas don't produce enough — or any — economic benefit and that the project is being rushed. Some also asked for the plan to be put to a public vote. "This city is on the verge of insolvency. As far as I know, we still technically qualify for bankruptcy under federal law," said Councilwoman Sandy Sheedy, who opposed the plan. She added the project "will scoop up every nickel and dime" left in the city's budget. 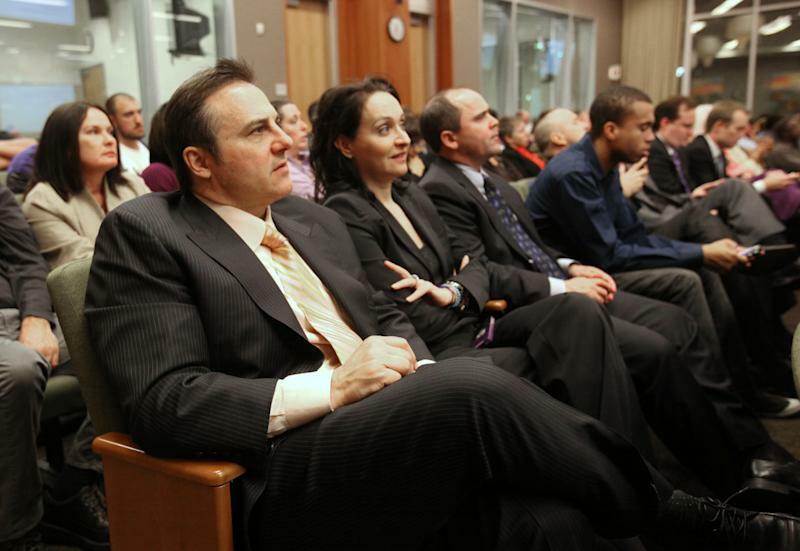 Proponents echoed the mayor and city manager's stances, trumpeting job creation and saying the economic loss if the Kings left would be even worse. In the end, those voices spoke to the majority. The passage of the plan highlighted a turnaround for a town that once seemed assured of losing its only major professional sports team. The Kings appeared determined to move to Anaheim last year before Johnson convinced the NBA to give the city one last chance to help finance an arena. At one point, Johnson seemed so certain the team was gone he called the process a "slow death" and compared the city's efforts to keep the Kings a "Hail Mary." Johnson made a desperate pitch to the NBA Board of Governors last April, promising league owners the city would find a way to help finance a new arena to replace the team's current outdated suburban facility. He also bought time by presenting more than $10 million in commitments for new advertising, ticket purchases and other financial support from regional businesses for this season. The NBA's relocation committee, headed by Oklahoma City owner Clay Bennett — who moved the team now known as the Thunder from Seattle in 2008 — recommended that the league give the city a shot to follow through and handed down a March 1 deadline to come up with a plan to help finance an arena. Johnson delivered the agreement last Thursday — on March 1, no less — to send the plan to the City Council. "A year ago, this was the longest of long shots," Johnson said. "That's one heck of a comeback."